- It's not the cold climate that bothers me....it's the fact that I have to bundle up to walk from my car to the building but once inside it's warm and cozy and then I'm stuck lugging around a big jacket all day (check that...I don't have a big jacket, but I'm stuck lugging around my little, So. Cal, jacket all day). Speaking of Check That...maybe they have a place to check my coat. - I'm listening to a GREAT new worship CD on my iPod. 'Scattered Around' is the new CD from Brandon Grissom who heads up the junior high worship here at Willow. He wrote every song except one (wich happens to be my least favorite song on the CD...). I'm pretty sure we're going to carry it at www.simplyjuniorhigh.com but if you can't get it there, I'm sure you can track it down by calling Willow Creek. Even if it sucked, I'd recommend it because it's the product of a junior high youth worker. But it doesn't...it's fantastic. -My daughter, Kayla, called yesterday from Kenya for the first time. I missed her call but Rachel called me to give me the update. She is having an amazing time. Interestingly enough, the highlight of her trip so far has been visiting a woman's prison and leading worship. I really miss her...much more than I thought I would. She'll be home next Monday afternoon. "Kurt, while I was reading this I kept thinking about you. You'll have to read it yourself to understand why!" After reading that note, how could I not read the book! 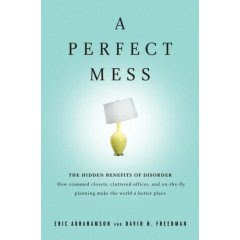 A Perfect Mess chips away (fairly convincingly) at the age-old belief that a tidier, more organized life and workspace is a more productive life and workspace. I'm wondering if there is another profession that feels this tension any more than youth ministry. I really love the early part of the book that breaks down just how much time and productivity is actually lost in the pursuit of order and organization. My friend was right. It seems like I'm seeing myself on every page. After a little bit of a rocky start last week to our 'Blindspots' series, I think we dialed it in really well this weekend. Both weeks were fairy strong subject matter, but I think we tied the connection of the beliefe of no absolute truth to the belief that all religions are the same pretty well. Students were tracking and asking TONS of questions after the program was over which is always a good thing. The only real 'miss' this week were the discussion questions I prepared. Having students circle up together for some discussion questions is new to us and not something we do all the time. This week, the questions were a bit too heavy and required students to put themselves out there a little too much which resulted in a noticeably quieter tone during discussion time. For some reason, I'm having all kinds of trouble with my switch to the 'New Blogger'. One problem is that most of my recent posts are showing up dated February 8 which causes them to show up down the page a bit instead of at the top...weird. Second, I've had all kinds of trouble with the comments feature. It allows comments, then it doesn't, then it does...strange. Finally, it tweaked around with my template and I'm having a hard time getting my old look back...freaky. Josh Griffin usually helps me figure all this stuff out so I'm sure we'll get to the bottom of it soon! 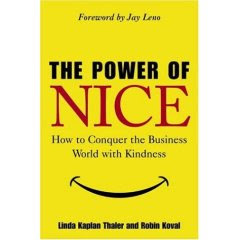 by Linda Kaplan Thaler and Robin Koval. It's a super quick read and is full of tid-bits that apply to ministry. As I read through it, I kept finding myself thinking, 'Gosh I wish a Christian had written this book first!' This type of book written through a Christ-centered worldview would be fantastic! "Every now and then I really miss the data base". As quoted by Eric Busby,our chief technical guru at the church, who has recently switched his focus to web development after several years spent developing our follow up systems. It's funny as a joke, but what makes it hilarious is that he was totally serious. We are doing a two week series called Blindspots in which we are looking at a couple of areas that, if you aren't paying attention, will cause a collision. In hindsight, the idea of blindspots is probably better suited for high schoolers who already drive...it took me a solid five minutes to explain the whole concept to our students and then to try to apply it as a metaphor for life took additonal effort! Additionally, trying to tackle the subject of absolute truth in 20 minutes was really tough. One thing that has helped us with bigger, tougher topics has been the decision to cut some of the game time in favor of group discussion questions to get them thinking about the topic a little bit ahead of time. This week, we actually had two sets of discussion questions and didn't play any games at all. At 5:30 this morning, I hugged my daughter as she boarded a bus bound for the airport. She's joining a team of about 35 others for a two week mission trip to Kenya. She is one of only three junior highers on the team that will spend it's time at health care clinics, training church leaders and running a camp for street kids. I'm fairly laid-back and not easily shaken, but I was still suprised at how easy it was for me to wave good bye to my 7th grader as she headed off for what, without question, is one of the biggest events of her young life. She hasn't always shown a ton of interest in missions, and she certainly isn't some sort of spiritual super star. She's just a 12 year old kid who felt God tugging at her heart to do something. And I'm tearing up just writing about it. Here's the current top 10 praise and worship songs in America this week according to CCLI. Interesting that Chris Tomlin has 5 out of 10. Has that ever happened in secular music? Did the Beatles ever have 5 top 10 songs at once? Madonna? Michael Jackson? The pool of people contributing to the praise and worship genre is probably quite a bit smaller, and I imagine the shelf life of a worship song is much longer, but it's still an amazing feat. ....Maybe youth ministry isn't as stressful as I thought! p.s. How would you like to work in the building on the other side of the fence! - Text books are harder to tear up than they look. - Art has been, is and always will be underappreciated. - Even if your boss can't hear you, he'll end up hearing what you said. - A genuinely nice gesture, no matter how awkward, is still a lot better than no gesture at all. - Some people appreciate art. This morning was the annual 'dad's day' at my Kayla and Cole's school. Each year, before we are released to spend some time in the classes with our kids, all the dads are asked to gather in the auditorium for about 20 minutes to hear from the administration, to hear about opportunities for involvement with the school etc. They inevetably end up recognizing a few guys for their various contributions. I have made no contributions...none. In fact, I am running a contribution deficit because I had agreed to speak in three of the junior high chapels this year and I have backed out of all three! I am well aware that I have made absolutely zero contributions to the school. At the end of the program, the elementary principal (our school is k-8 grades) grabbed the mic and announced, "I'd now like to recognize three dads who have contributed in some small ways to help make this year a great one.... These dads have NO IDEA I'm about to call their name, but when I do would they please hustle up to the front." He then called three names one of which was Mr. Kurt Johnson. Now, I know that my real name is Johnston with a 't' but most people mispronounce it. When I heard my name called I instantly thought, 'That's weird, I have done absolutely nothing to deserve this....but what the heck!' I then hustled to the stage only to be met by an awkward look on the principal's face and three other men....one of which was the real Kurt Johnson....with no 't'. If we were to ask a hundred people what makes a good jr. high leader, we’d probably get a hundred different answers. Personally, I’m of the belief there are leadership qualities that transcend context. In other words, a lot of the leadership qualities needed to be a good CEO are the same as those needed to be a good President which are the same needed to be a good junior high worker. These qualities are numerous, but let me give you three, that I try to remind myself of every day. · Not playing favorites with the ‘cool’ or ‘church’ kids. · If you get paid, making the most of the time you are ‘on the clock’. · Not exaggerating stories you tell in your lessons. · Saying an honest ‘no’ to another request instead of saying yes and becoming bitter. 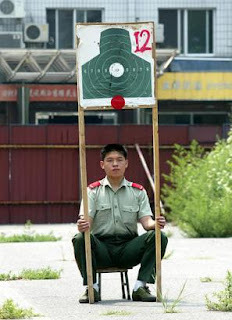 A good definition of effectiveness is ‘doing the right things’. In life and ministry, there are lots of good opportunities. Effective leaders recognize that not every good opportunity is a good opportunity for them. Just because someone has an idea for an activity or suggests a new curriculum or finds a great new service project doesn’t mean you need to add it to your junior high calendar! My phone rings several times a week with opportunities for our ministry that “are just too good to pass up”… the door-to-door fundraiser selling lifetime supplies of cellophane, the traveling evangelist who uses a yo-yo and a watermelon in his presentation etc. I almost always pass them up. When you’re done reading this post, I encourage you to think about your junior high ministry and make a list of the things that are most important to it’s effectiveness. Be sure not to let other stuff crowd these items out. A good definition of efficiency is ‘doing things right’. Junior high ministry is notorious for being inefficient. We’re messy. We get home from trips late. We forget to make a flyer. When we do make a flyer, it’s full of typos. We have a hard time staying within our budget. We procrastinate. Sound familiar? Being efficient takes work, but it is incredibly rewarding for you as a leader and for the ministry you are leading. When I was growing up, I would constantly find short-cuts when doing chores such as mowing the lawn or washing the car. My dad would constantly find mistakes in my work and say “Kurt, it’s funny that you never seem to have time to do it right the first time, but you always have time to do it over again.” Efficiency is the art of learning how to do it right the first time. Leadership isn’t easy, but since you are one you might consider helping your cause by being one who is ethical, effective and efficient. My wife saw The Last Sin Eater while I was on my trip. It's based on the book by Francine Rivers and tells the story of one girl's journey to redemption. It's rated PG13 for some scary/intense scenes but could be worth seeing with a group of students. My wife said it was surprisingly good. I'm pretty sure, however, that it's in limited release so it may be tough to find. I think paying the 10 bucks to see these kinds of films is a great way to support the writers and producers who are trying to use the medium of film to expose people to the gospel. Granted, I don't think I feel that way about the Left Behind movies....but most of the time it seems like a good thing to do! - 5 days is WAY too long to be away from my family! I travel a fair amount for this or that, but I'm rarely gone more than a couple of days. Wow, I really miss them. - Virtually every guy on Saddleback's student ministries team has a 'soul patch'. I've never really noticed this, but it was pointed out by several different people I met at the conference. I'd shave mine, but it's just about the only hair I have left. - Until now, I have had no idea what cold really is. It's been around 3 degrees every night. I remember going snow boarding at night a couple of times in temperatures around 20 degrees or so and thinking how cold that was. Silly California boy! - Most youth workers are simply in need of some hope and some help. All the deep theological stuff is fine, but for the average youth worker some encouragement and some practical tools are bigger needs. - 'No Ringy....No Dingy!' Lakita Garth's catchy phrase for abstinence. I'm telling you....after five days away from my wife I'm very glad I have a ringy! - I am officially done with trying to be cool. I don't know what that means, exactly, but at 41 and having been at yet another youth worker event filled with twenty somethings who truly are cool, I think my time of trying is over. - I am more in love with Jesus, more humbled by his grace, more called to junior high ministry, more thankful for my ministry friends and more excited about the future than ever before. Two of our interns, Stephen and Brian, tag-teamed our lesson on teamwork and every report I've heard is that they did a superb job. The primary focus of their lesson was the idea that we were all created to be teamed up with God and teamed up with each other. Stephen has taught several times for us and always does well, but this was Brian's first time....the word on the street is that he hit a home run. Apparently our music struggled just a bit due to an out of tune guitar or two but, really, who cares. Years ago when we decided to have junior highers lead worship we knew we would have some off days. I'll take out-of-tune junior highers over finely tuned adults any day! We walked a few blocks last night to a great Italian place for a late dinner. The neat thing about downtown Indy is that virtually everything is connected by indoor skywalks so you rarely need to go outside to brave the cold. After a really good meal, we were all feeling a little daring so we decided to walk home in the great outdoors instead of in the skywalk. Of course this idea was dreamed up by a bunch of people from Southern California whose idea of cold is 45 degrees!. It was 9 degrees outside and took about 1 minute for us to regret our decision. 10 minutes later we got to the hotel and my toes were freezing. The dude at the skate shop never thought to tell me that the Converse shoes I was purchasing would be a terrible choice to wear should I ever find myself in Indy late at night walking on icy, snowy streets in sub-freezing weather. I was rooting for the Bears on Sunday, but since I'm on my way to Indianapolis for a few days I'm kinda looking forward to the 'buzz' around the city. We're flying in early to help prep for the Group/Simply conference. I'm looking forward to the weekend and the 8 hour middle school ministry track. Several people have asked to see the survey/questionaire we asked our students to fill out last weekend. Below, I've listed the questions from our survey as well as the results from my weekend students. It's important to state that this survey was only for the purposes of evaluating our large group weekend program. There are a couple very suprising discoveries. 4. On a scale of 1-10, how would you rate the following parts of our weekend? We are still getting the results for how much time they spend doing the activities we listed. The favorite movies were all over the map, but the favorite genre by far was comedies. I'm SHOCKED at the 99% answer to: "I have accepted Jesus into my life". I've got a few thoughts such as maybe the seeker students and newer students may have left this question blank (we had lots of blank answers on this question...). It also reminds me that our church is getting older and we have fewer seeker families. It also makes me realize we aren't reaching out to unchurched kids the way we could. And finally, and maybe most importantly, It points out all kinds of stuff about the way we explain faith in Christ, being a Christian, their understanding of it etc. because that figure is uncomfortably high. While some youth pastors might be thrilled with it, it creates way more questions for me than answers. We used to use the Sunday in between Christmas and New Years each year to do our annual Wildside survey, but a few years ago we began to combine with our high school ministry on that Sunday so we had to quit doing the survey. It never seemed to fit well any other time, so we haven't done it in a few years. I'm not sure if it fit perfectly this weekend either, but we wanted to bring it back. The survey consists of about 20 questions geared to help us get the spiritual and culutral pulse of our students. When we get everything tallied, I'll post the survey and results. The So Cal Connection is a group of full-time middle school and junior high youth pastors from LA to San Diego who get together twice a year to hang out, talk shop and share ideas. Yesterday, we met at Mariners Church and dedicated the entire day to simply sharing practical, useful ideas that are working in our ministries. There was a TON of great stuff shared and it served as an incredible reminder that God really is doing some exciting stuff in our churches. I really liked one teaching series idea that was shared by Ryan Nielsen and thought I'd pass it along. I thought this was a super juniorhigh-friendly series. In fact, I can't wait to find room in our teaching schedule to do it ourselves. Words really can't explain this. You need to visit the website on your own. Also, be sure to check out the demo video. It's perhaps the most ridiculous thing I've ever seen that I really want.